As part of his Jubilee festivities, Pope Francis has met with the severely disabled, prayed and snacked with them. According to a statement released by the Holy See Press Office, Pope Francis visited the “Chicco” community as part of the Jubilee Year’s “Fridays of Mercy,” at 5:00 p.m. Friday. This marked the fifth sign of mercy made by Pope Francis in the course of the Jubilee: In January, he visited the rest home for the elderly and the sick in a vegetative state; in February, the community of drug addicts of Catelgandolfo; in March, the ‘Cara’ hospitality center for refugees at Castelnuovo di Porto; and in April, the Island of Lesbos to meet with refugees. ‘Chicco’ is an association that belongs to the great family of L’Arche, founded by Jean Vanier in 1964. It is present in more than 30 countries in five continents and, together with the “Faith and Light” Association, is dedicated to the weakest and most marginalized persons of society. The “Grain” community was the first to be established in Italy. Founded in 1981, today, it houses 18 persons with severe mental disabilities. A second structure is in Bologna and a third might be opened shortly in Sardinia. The aim of these “family homes” is to receive individuals with serious disabilities to make them feel accepted and protagonists of their life and of that of those dedicated to them. L’Arche’s supporting idea is to “praise imperfection,” namely to make the public aware that no one can be discriminated against for any form of disability. With this visit, the Holy Father expressed one of the most salient traits of his Pontificate: attention to the simplest and weakest. In bringing them his tenderness and affection, he wished to give a concrete sign of how the Year of Mercy can be lived. To the community which survives on donations and subsidies, Francis made a personal contribution of pasta, fruits, cherries and peaches which were welcomed with the joy and applause of residents. 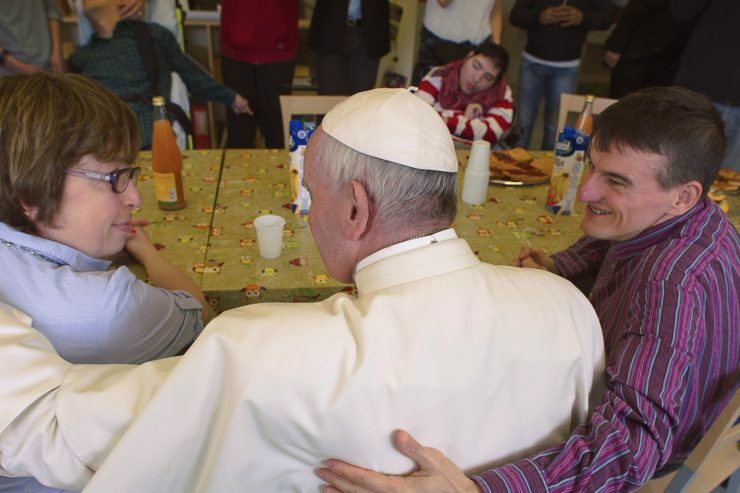 The Holy Father sat at table to have a snack with the disabled and the volunteers, and listened to the simple words of Nadia, Salvatore, Vittorio, Paolo, Maria Grazia, Danilo … sharing this family moment with joy and simplicity. Moreover, he was also able to visit the most severely disabled, expressing signs of profound affection and tenderness, in particular, to Amando and Fabio, who were the first to be received. L’Arche’s founder believed that the disabled need to develop a life made up also of manual effort, according to each one’s capacity. Given this, Pope Francis went to the handicraft laboratory, where small objects of craftsmanship are created daily, which express the creativity and imagination of the community members. Finally, before leaving around 6:30 p.m., Pope Francis prayed with them in the small chapel, holding hands, and embraced all. According to official data of the Holy Year on May 12, so far, more than 7 million (7,133,256) people have participated in Rome’s Jubilee events.